Our family believes in quality craftsmanship that adheres to strict purchasing procedures and wholesale prices. That means you get only the best without sacrificing a value you can afford. Minichiello Jewellers offers only the finest of quality loose diamonds in any shape you can imagine. We uphold strict buying procedures to ensure that each diamond you view and receive meets our selective Four C criterias. All of our diamonds are independently graded and certified by reputable gemology houses across the globe. Carat is the easiest to understand of the four C’s but is the most misunderstood. Often, people think carat refers to the diamond’s size when it actually refers to its weight. The carat of a diamond is subdivided into 100 equal parts, called points. One point equals .01 carat (or 1/100 carat). A half carat diamond is 50 points. A one-carat diamond is 100 points. It is commonly thought that the larger the diamond, the more it will cost, but differences amongst the other C’s can make a smaller diamond much more valuable than a larger one. Because diamonds are formed deep within the earth’s surface, they often have some type of ‘birthmark’. This is either inside the diamond, an inclusion, or on the surface, a blemish. The location, size, and visibility of the birthmark will determine the clarity grade of the diamond. We carry only diamonds that are ‘flawless to the eye’. In other words, no inclusions or blemishes are visible to the naked eye, they can only be seen under 10x or higher magnification. 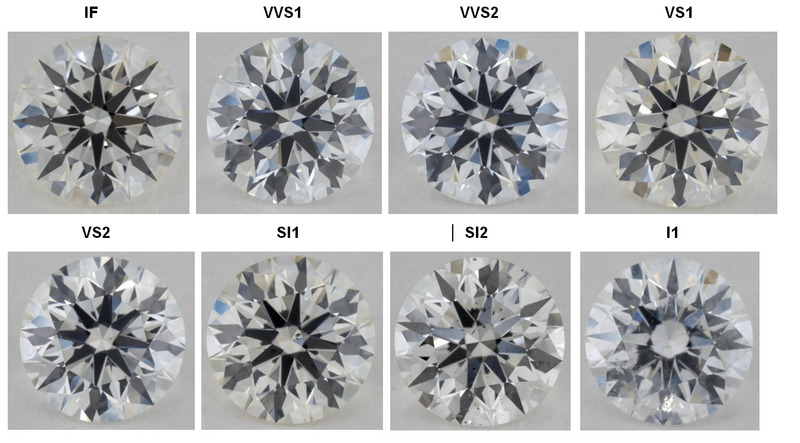 This includes diamonds graded from Internally Flawless to SI-2 Clarity. Nearly any colour of the rainbow can be found in a diamond; however, those diamonds with less colour are considered higher in value and are the most sought after. Diamonds are rated on a scale of D to Z for their colour; when a diamond approaches colourless, it receives a rating of D, increasing its value. Once a diamond begins to show colour, the value slides down the scale. At Minichiello, we keep our diamonds in the top 5 grades of the Colour Grade Scale: from D to H.
Also referred to as “brilliance”, Cut refers to the symmetry and polish of your diamond, affecting the sparkle and scintillation. Cut is one of the most important factors of the four C’s. Even if your diamond has a high colour grade and perfect clarity, if the cut is poor, it will appear dull. At Minichiello, if we wouldn’t wear it, we won’t carry it. Which is why we carry only Excellent to Very Good, ensuring that every customer goes home with the most sparkle. Minichiello Jewellers includes a warranty for each piece of jewellery sold under conditions of normal wear and tear for the time period of one year. This time period starts from the date of pick-up from our store. If a problem should arise during this one year time period we kindly ask you to bring in the jewellery item, along with the bill of sale, for our inspection. With their extensive knowledge and experience in the jewellery industry, Minichiello Jewellers reserves the right to determine whether the condition of the jewellery piece falls under normal wear and tear. If it is found that the issue arises from normal wear and tear, we will gladly repair the item or replace any small stones at no charge. If the issue falls outside of what is considered normal wear and tear for jewellery or is outside of the one year time period, we will repair or replace at the fairest and reasonable price possible. Please note, this warranty excludes the centre diamond(s) or centre gemstone(s) of an engagement ring or right-hand ring. While diamonds are considered to be the hardest known natural material, they can be susceptible to chipping or breakage when struck at just the right angle or position. In these unforeseen cases, Minichiello Jewellers recommends having your piece of jewellery insured and scheduled with your local insurance provider.